Do not place candles near combustible materials. Remember to leave a one foot circle of safety around any burning candle. Never leave children or pets unattended in a room with an open flame candle. 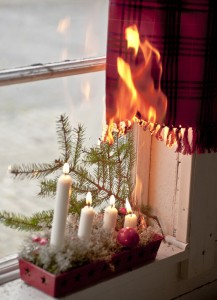 Do not place candles on window ledges or near entryways. The potential air draft can “fan” the flame, potentially catching curtains or other materials on fire. Always extinguish candles before leaving the home. When you go out, blow it out!. Remember, candles can present fire hazards outdoors on decks and patios as well as inside your home. For more information, you can visit the National Candle Association’s or NFPA’s websites.